Sean Coffey and the Southeast Knights were due. 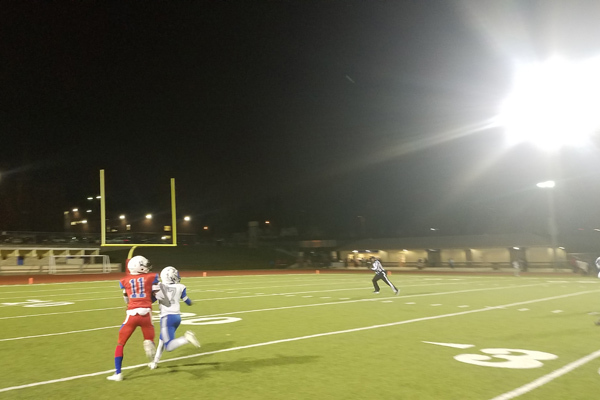 And the Interscholastic League team need not apologize for their first win of the season after a 58-6 thumping of visiting Kansas City Central. The IL tilt featured two teams with a combined 1-9 record on the season. The Knights, however, were winless. Not anymore. The Week 6 victory was Coffey’s first as a high school head coach. The ‘W’ also satisfied a large contingent of Southeast fans at IL Stadium for the school’s homecoming game. In other words, the night, if not the Knights, was perfect. Central head coach Allen Supplee was not as happy. Naturally. But what coach is after repeated breakdowns and costly turnovers? Supplee saw his squad drop to 1-5 overall on the season and 1-2 in league play. Turnover after turnover was Central’s undoing. Practice will shore up ball security issues, Supplee said. “We just have to keep working,” he said. Central started fast but Southeast started faster. The Knights rarely let up. The quick-strike scoring was a delight to the throng of festive Knights fan. The host team raced out to a 16-6 first-quarter lead after the Blue Eagles returned the opening kick for a touchdown. The momentum was short lived. Southeast jogged into the locker room at halftime firmly in control at 34-6. The four-touchdown lead gave the Knights rare breathing room this season. They used it to spearhead a dominating second half. They outscored Central 24-0 in the second half. “We worked hard and deserved it.” said Dremel Jackson, a sophomore tight end and defensive lineman. Jackson scooped up a fumble and returned it for a score before punctuating a dominating night with a receiving touchdown. The triumph under the lights at Bryan Field was just what the doctor ordered for a young, hungry squad. It should make for a better homecoming dance, Jackson said. The Blue Eagles’ season-long struggles continued a year after sharing a league title with the Knights and Lincoln Prep. Central made noise in the process. This season has Supplee screaming “rebuild.” The veteran coach despises the word. For Coffey, the former football star at Missouri was ecstatic about his first career win. He delighted in the sheer joy on his player’s face after the game.